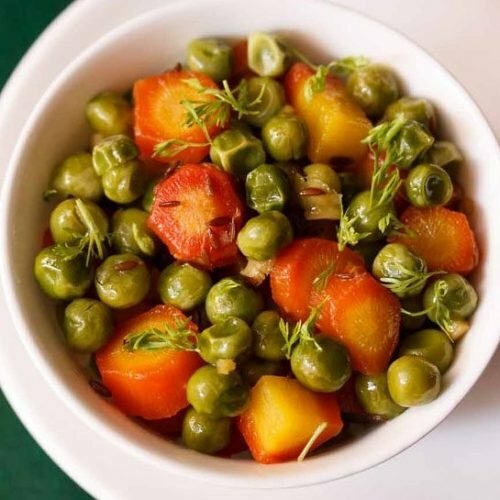 gajar matar sabzi recipe - delicious dry sauted carrots and fresh green peas. peel, rinse and chop the carrots (gajar). heat oil in a pan or kadai. add the cumin and saute them. add the ginger and green chilies. if you want then you can also add red chilli powder at this step. saute for a minute or till the raw smell of the ginger disappears. add the carrots and green peas (matar) along with the salt. saute for 3-4 minutes. if the veggies start to get browned, add some more water. cook the veggies for 15-20 minutes till they are done. sprinkle garam masala and stir well. serve gajar matar sabzi hot with some phulkas or parathas or as a side dish with dal-rice combo or kadhi-rice or curd rice.